Walk to an island populated only by egrets, and maybe find Captain Kidd's buried treasure. Round-trip from parking lot to Charles Island and back. Additionally, there is a mile-long boardwalk from Silver Sands Beach to Walnut Beach. Shoes are a must to walk here: the beach has more shells than sand. Be cautious when walking on the sand bar because the tide comes in quickly and makes strong currents that can easily knock you down. Difficulty rating for kayaking is a 3, due to the unusual pattern of currents. Lifeguards are on duty in summer only. It's a mile from the parking lot to Charles Island, but you'll want to allow time for bird watching, shell gathering, and admiring the view. Want more? There's about a mile of boardwalk running west from Silver Sands to Walnut Beach. The interior of Charles Island is closed May 1 through August 31 to protect heron and egret rookeries, but you can still walk along the edge of the island and get a great view of the birds perched in the trees. Pets are prohibited on the beach and boardwalk. Pets kept on a leash, no more than 7 feet, are permitted in the picnic areas. 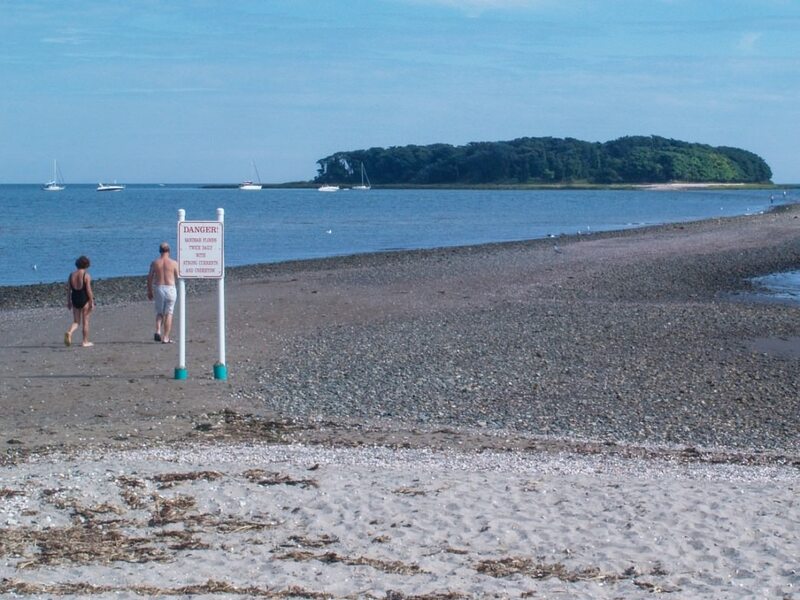 Most of the day, Silver Sands State Park looks like an ordinary New England beach; it's covered with thick bands of shells and rocks and precious little sand (be sure to wear shoes! ), and you can see a tree-covered island in the distance. 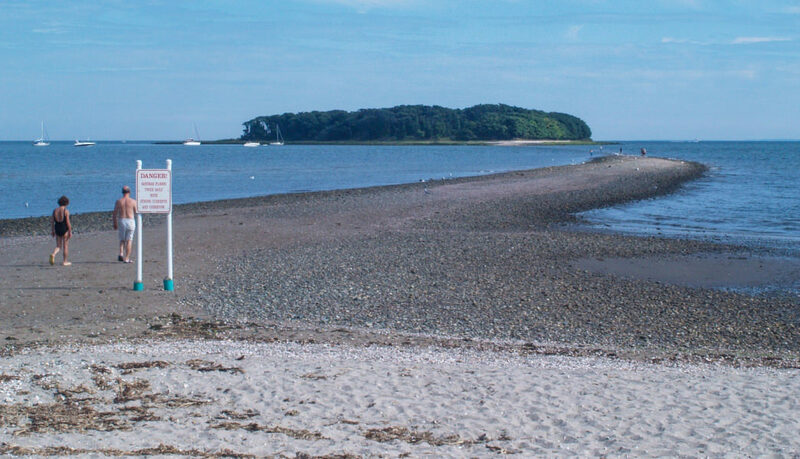 But at low tide, a magical thing happens: the Long Island Sound pulls back to reveal a long tombolo, which you can walk on all the way to that little island. The park's boardwalks offer views of dunes, salt marsh, and Long Island Sound. Ever wanted to feel like Moses at the parting of the Red Sea? This is probably the closest you'll ever get. When the tide pulls back and reveals the tombolo, it feels like Nature has let you in on a sacred secret. The sand bar is visible for only a brief window each day, which makes the experience feel all the more special. Walk halfway out to Charles Island, then turn back to look at the shore and marvel that you are standing in the middle of the open water, with boats on either side of you. Check a tide table before you go. You should arrive at the beach at least 30-45 minutes before low tide so you will have time to walk to Charles Island and return before the sand bar disappears. Before sunset there is usually a park ranger on duty to warn visitors when they need to head back to the mainland. According to local legend, the famed pirate Captain Kidd buried his treasure on Charles Island in 1699. Today, it is a protected nesting ground for herons and egrets in the summer, and for hawks, snowy owls, and short-eared owls in winter. Birdwatchers, beachcombers, families, spiritual seekers, Israelites escaping Egypt. Exit 35 off I-95. Follow Schoolhouse Road south to Route 1 (Bridgeport Avenue). Turn left onto Route 1 then right at first light (Silver Sands Parkway). Follow across Meadowside Road to main parking lot on right. There's a small handicapped parking lot past the main lot. There are portable toilets available, and alcohol is prohibited. The boardwalk is wheelchair accessible.